North Korea’s submarine-launched ballistic missiles are making steady progress. North Korea conducted another test of its KN-11 (Polaris-1, or “Bukkeukseong-1”) submarine-launched ballistic missile (SLBM) in the Sea of Japan. According to South Korea’s Joint Chiefs of Staff, the launch took place at 6:30 p.m. local time. In a statement released after the launch, North Korean state media stated that the test sought to “confirm the stability of the underwater ballistic launching system in the maximum depth of waters, flying kinetic feature under the vertical flight system of the ballistic missile powered by the newly developed high-power solid fuel engine, the reliability of the phased heat separation and the working accuracy of nuclear detonating device of the warhead.” The statement added that Kim Jong-un, North Korea’s supreme leader, was satisfied with the result of the test. The characteristics of this week’s test are notable for a few reasons. First, according to South Korea’s Joint Chiefs of Staff, the Polaris-1 flew for about 30 kilometers, which, while falling short of the maximum desired range, represents clear progress over previous testing. Second, images of the launch released by North Korean state media showed, for the first time, what appears to be the ejection of the SLBM from a Sinpo-class submarine’s launch tube (though this isn’t a certainty; the footage could be of a barge-based launch tube). While Pyongyang has claimed to have carried out successful submarine ejection as part of its previous tests, it hasn’t released undersea imagery to substantiate that claim. Finally, a big iterative improvement in this week’s test is what appears to be North Korea’s adoption of solid fuel for its SLBM. As part of its spate of missile testing this spring, Pyongyang has showed off advances in solid fuel propellant technology. The iteration suggests that the Polaris-1 is no longer most closely approximated by the Soviet Union’s R-27/SS-N-6 Serb SLBMs, which used a single-stage, liquid propellant design. If North Korea has started to figure out solid fueled SLBM, the closer analog might be something like China’s older JL-1 SLBM or even India’s K-4. 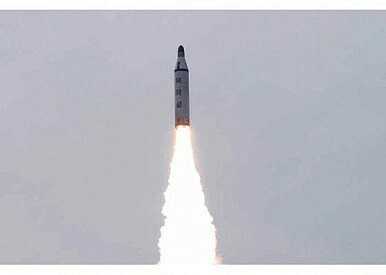 Safety may have been a concern for North Korea in exploring the solid fuel option. Based on released imagery, the latest test shows a cold launch (where the missile is expelled from the submarine through gas pressure), followed by ignition. A liquid fuel, hot launch would be considerably less complicated from a technological perspective (nullifying the need for a gas ejection mechanism), but the potential for something to go wrong is far higher. Instead of pursuing a riskier, but simpler SLBM (something like the Soviet Union’s R-21, which was hot launched and used liquid propulsion), North Korea may be exercising caution. North Korea’s SLBM program is particularly worrisome for South Korea and the United States. If Pyongyang succeeds in its venture to create a reliable, solid-fueled nuclear-capable submarine-launched ballistic missile, it will have a “second strike” nuclear deterrent, complicating any future conflict on the Korean peninsula. Even though both the Sinpo-class submarine and the Polaris-1 SLBM remain imperfect and in testing, Pyongyang is showing steady progress in improving its capabilities. Moreover, this latest SLBM test comes as expectations for a fifth North Korean nuclear test grow ahead of May’s Workers’ Party Congress. South Korean intelligence has reported heightened activity at Punggye-ri, North Korea’s underground nuclear testing ground.